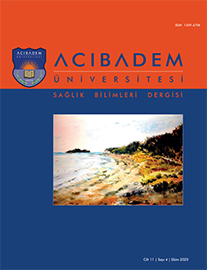 2Ağrı İbrahim Çeçen Üniversitesi, Sağlık Hizmetleri Meslek Yüksekokulu, Ağrı, Türkiye Aim: This study aims to identify the level of concordance with fluid restriction and the factors which affect it in individuals receiving hemodialysis. Materials and Methods: This descriptive study was conducted on 88 individuals who received hemodialysis between December 2016 and February 2017. Data were collected using the Patient Identification Form and Fluid Control Scale in Hemodialysis Patients (FCSHP) and analysed using Student"s t-test, one-way analysis of variance (ANOVA), Kruskal-Wallis H test, Mann-Whitney U test, LSD Post Hoc test, and Pearson Moment Correlation analysis. Results: It was found that individuals receiving hemodialysis had a moderate level of concordance with fluid restriction (51.23±5.88); they had high levels of knowledge regarding fluid restriction (20.22±1.07); and they had a moderate level of concordance in terms of behavioral aspects (22.42±4.23), but low levels of concordance in terms of the attitudes aspect (8.59±2.61). Individuals" concordance with fluid restriction was found to be influenced by gender and marital status; knowledge level was found to be influenced by gender and treatment duration, and behavior was significantly influenced by gender. Women, in comparison to men, were found to have higher concordance levels in terms of knowledge, behavior and total fluid control aspects; single patients" level of concordance with total fluid control was higher compared to married patients, and the level of knowledge about fluid control was lower in patients who had had a treatment duration of 6 months to 2 years, in comparison with other groups. Interdialytic weight gain decreased with increasingly concordant attitudes and total scores for fluid control, and the amount of ultrafiltration needed decreased with the increase in behavior and total scores.